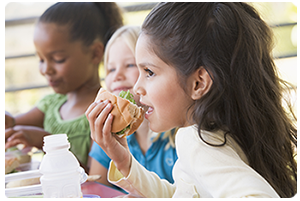 Despite schools across the nation making strides towards improved lunch programs, and healthier options in the cafeteria, many benefits still remain for those who pack a lunch from home. Preparing nutritious lunches and snacks for your son or daughter to bring to school can have positive impacts that extend further than your child's health and development. The most obvious benefit of packing a lunch for your child instead of giving them money to buy cafeteria food is control. From the selection of the meals themselves to the quality of ingredients, when you pack a lunch from home you know exactly what your child will be bringing to school. With this control you can plan and balance their daily consumption with other meals like breakfast and dinner to make sure they’re getting in all of their daily nutrition, while also encouraging them to avoid unhealthy choices and practice healthy portion control. Rather than having your child choose from a fixed cafeteria menu that has to appeal to hundreds of kids, you can pack a healthy lunch full of items that you know they'll enjoy. This can help prevent children from just throwing away the things they don't like while also encouraging them not to go looking for the nearest vending machine. Switching things up from the traditional PB&J to a fresh salad or sushi can help keep healthy eating from getting boring and repetitive as well. You can also use a little creativity to make meals more appealing to picky eaters , like a holiday-themed bento lunch or just a simple smiley face made of ketchup. Along with filling their lunch bag or lunch box with food you know they'll enjoy, you can also tailor your kids' lunch specifically to their schedule. Does your son or daughter have sports after school, or a big test last period? Packing a lunch full of carbohydrates and lean protein will give them a boost of energy and keep them focused throughout the day. For the many parents concerned with food allergies, a home-packed lunch can assure you that your child will be eating safely as well. Packing a lunch from home, especially with the help of reusable containers and bags, can help prevent pollution, avoid unnecessary waste, and conserve natural resources and energy. According to the EPA , the average American school lunch creates 67 pounds of thrash a year, accumulating to 4.6 billion pounds of waste each year in America alone that could be avoided. Using reusable containers, bottles, and insulated lunch bags are a simple and effective solution to keeping healthy meals fresh, while also helping the planet.